Everyone should be lucky enough to get therapy, from folks smart enough to see and call you out on your issues. If you can’t afford professional therapy, start with self-therapy, and a cognitively diverse group of friends, colleagues, mentors, and advisors, whom you can enable to constructively critique your words and behavior. What psychologists call cognitive behavioral therapy (CBT) is a great tool for building both emotional and cognitive intelligence. It could be more accurately named Emotional-Cognitive-Behavioral (ECB) therapy, as this therapy works to raise our awareness and control of our emotions, cognitions, and actions, as a triad of interacting systems (or in Kahneman’s model, two competing systems) what we have been calling the ECA cycle. This diagram (picture right) of CBT by Wikipedia user Urstadt shows the model. The diagram also depicts another interesting but perhaps less validated CBT idea, that our core beliefs can be grouped into three key categories: beliefs about ourselves, about others, and about the future. 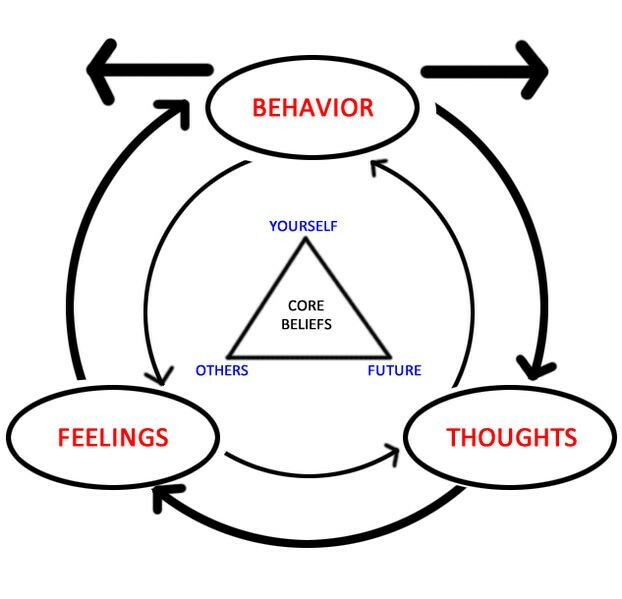 In the view of CBT in this diagram, our thoughts and cognitive memories constantly pull us toward specific ideas about the future. Recall Daniel Schacter’s idea of the prospective brain in Chapter 1. From this perspective our current feelings (and emotional memories) and behaviors also play a role in foresight, but as supporting players. In other words, it argues that the quality of our thinking really is the pillar of foresight. There are plenty of good books on CBT, which is most effective when practiced on you by others. This is usually your therapist, but as you understand it better you realize it can and should include your relationship and business partners, family, friends, coworkers, and mentors. Anyone who makes the effort to get to know your feelings, thoughts, and behaviors, and who can offer therapeutic interaction, is a potential therapist. As you learn how it works, you will get very good at offering this kind of therapy, navigating the ECA cycle, with your colleagues and clients in return. Good CB therapists can be found lots of places online, including Yelp. For CB self-therapy, a good place to start is Christine Wilding, Cognitive Behavioral Therapy: Teach Yourself, 2012, which outlines CBT uses in all aspects of your life. For advanced work, practical exercises and worksheets can be found in Gregory’s Cognitive-Behavioral Therapy Skills Workbook, 2010. There are also lots of good specialty books. David Burns Feeling Good, 2008 offers many CB techniques for mood management. There are similar books that focus on thoughts and behaviors, which we will discuss at another time.